Two separate beach projects have been proposed along a portion of South Ponte Vedra Boulevard and Coastal Highway. A community meeting was held Wednesday, January 16, 2019, to discuss the projects and provide information to the property owners to assist them in answering new surveys that were mailed the same week. 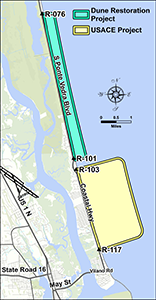 Both the one-time dune project proposed for a portion of South Ponte Vedra Boulevard and the 50-year U.S. Army Corps of Engineers (USACE) beach restoration project proposed for a portion of Coastal Highway were discussed, along with the proposed municipal service taxing unit (MSTU) levies and the associated surveys. The survey results will be counted on February 20 in preparation for possible continuation of the Commission's discussion of possible County funding at the March 5 Board of County Commissioners meeting. 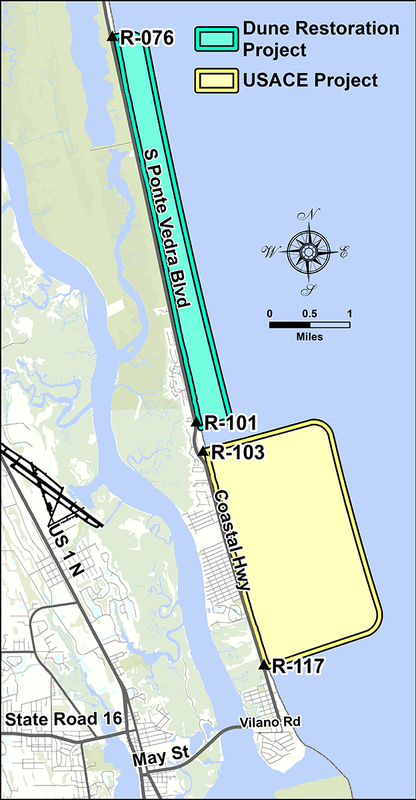 The current conceptual plan for South Ponte Vedra Boulevard oceanfront properties is for a one-time dune restoration project averaging approximately 20 cubic yards, or 540 cubic feet, of sand per linear foot from approximately 2539 South Ponte Vedra Boulevard southward to the northern boundary of Ocean Villas at Serenata Beach. The new dune contours will be engineered to maximize durability, and supportive vegetation will be planted to further increase dune resilience. The project could be funded with a combination of state, County, and MSTU funds. The State has offered Hurricane Matthew recovery funds to match the local expenditures for dune restoration, and the proposed South Ponte Vedra Boulevard Dune and Beach Restoration MSTU would levy 4.0 mils (four tenths of one percent) per year for ten years on the taxable value of the properties in the MSTU area to provide partial funding for the local share. The County could fund the remainder of the costs. To the south, the United States Army Corps of Engineers (USACE) has proposed a 50-year Coastal Storm Risk Management project for Coastal Highway properties that would extend southward from the southern boundary of Ocean Villas at Serenata Beach, north of 4600 Coastal Highway, to approximately 3244 Coastal Highway. This project would consist of extending the width of the beach by 60' and restoring the dunes. Periodic renourishments would follow approximately every 12 years as needed. The USACE would pay for a portion of the project, based upon the amount of property within a quarter mile of access with public parking. Efforts are underway by the County to improve the cost share ratio by increasing parking and public access to the beach. Additional funding is available from the State in the form of competitive Florida Department of Environmental Protection grants and Hurricane Matthew recovery funds. The proposed Coastal Highway Dune and Beach Restoration MSTU would levy 0.5 mils (five-hundredths of one percent) on the taxable value of the properties within the MSTU for the life of the project to offset County costs.